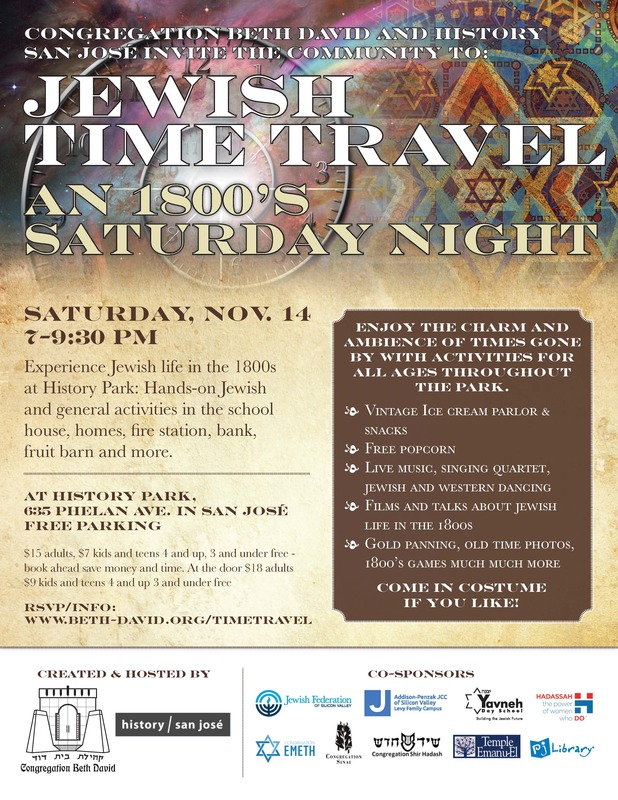 Congregation Beth David along with Jewish Federation of Silicon Valley, Addison-Penzak JCC of Silicon Valley, and Yavneh Day School team with History San Jose to present a step back in time – Jewish Time Travel: An 1800s Saturday Night. The one-night only event takes place on Saturday, November 14th from 7:00 – 9:30pm. Experience Jewish life in the 1800s at History Park; a 14-acre site featuring homes, businesses and landmarks that highlight Santa Clara Valley’s past. Attendees are encouraged to come in period costume. Activities for all ages include: Havdalah under the light tower, music and dancing in the town square, teen saloon experience, historic movies, panning for gold, the art of 1800s Tallit (Jewish prayer shawl) making; 1800s Kippah (Jewish head covering) crocheting, and more! Visit http://www.beth-david.org/TimeTravel for more information.